A sweet alternative to kayexelate? Trust the Swiss to approach a problem from a confectioners viewpoint. The options for managing hyperkalemia in dialysis patients have always been limited and unpalatable, but this preliminary clinical study from Berne provides some hope. It suggests that giving glycyrrhetinic acid may be effective. This compound, commonly found in liquorice, usually just makes up the numbers somewhere near the bottom of lists of causes of secondary hyperaldsteronism. It works by inhibiting the enzyme 11b-hydroxy-steroid dehydrogenase II, increasing cortisol availability at the mineralocorticoid receptor. It appears that there is significant expression of this receptor in the colon, potentially explaining the potassium-lowering effect in ESRD. Over 6 months of follow-up, the frequency of severe hyperkalemia significantly decreased from 9% to 0.6% in the treatment arm of this small, prospective RCT. Mean pre- and post dialysis systolic/diastolic blood pressure values were comparable on GA and placebo. 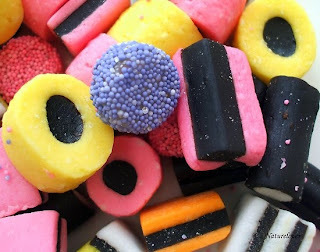 However, before you start reaching for the Allsorts, be aware that this was a tiny study (10 patients) and needs a longer term study of toxicity before widespread use can be proposed. Bone Scan for Diagnosis of Calciphylaxis? 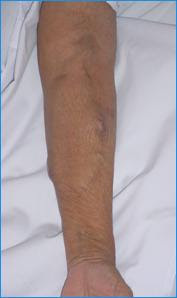 Calciphylaxis (also called calcific uremic arteriolopathy) is a syndrome of vascular calcification, thrombosis, and necrosis, occurring almost exclusively in ESRD patients. The diagnosis is typically achieved by clinical exam--demonstrating painful, necrotic, and sometimes ulcerating lesions usually on the lower extremities. Because there are other clinical entities which can cause similar lesions (e.g., nephrogenic sclerosing dermopathy, cryoglobulinemia, cholesterol emboli, vasculitis, etc), sometimes we need a "gold standard". Not uncommonly, a skin biopsy is carried out for the definitive diagnosis of calciphylaxis. However, there is some danger in biopsy: many of these patients have a difficult time with wound healing, and it would be preferable to have a non-invasive manner by which to support the diagnosis of calciphylaxis. A 2002 KI article by Fine and Zacharias provides evidence that a bone scan is fairly sensitive for this diagnosis and could be used in lieu of a biopsy. Their analysis indicated that 34 out of 36 patients with a diagnosis of calciphylaxis had an abnormal bone scan--most commonly reflected as showing increased uptake in the calves, typically in the areas of pain/ulceration (as shown on the left). Of note, this particular study does not really address how specific a bone scan is at excluding alternative causes of this type of dermopathy, but could still potentially be useful in the right clinical setting. Unfortunately, calciphylaxis still carries with it a very high mortality rate. One of the largest controversies in the field of proteinuria/nephrotic syndrome research derives from a 2007 Kidney International paper published by Russo et al. Briefly stated, the authors suggest the paradigm-shifting idea that the glomerulus filters massive amounts of albumin, and that nephrotic syndrome is a defect in tubular reabsorption of albumin. This flies in the face of decades worth of research on proteinuria, which based on a combination of micropuncture and other physiologic experiments in mice and man has led to the conventional model in which albumin is prevented from entering Bowman's space by the charge-selectivity of the glomerular filtration barrier, and nephrotic syndrome results from a breakdown of this barrier. What are we to make of such a debate? Who is right and who is wrong? The following is a (hopefully unbiased) list of the pros and cons of each side of the argument. Pro: Normal glomeruli filter nephrotic levels of albumin. The major piece of data in support of this hypothesis comes from the Russo et al paper in which the authors use a relatively new imaging technique, intravital 2-photon microscopy, which enables in vivo imaging of the kidney using injected fluorescent compounds at a resolution previously unachievable. Essentially, the crucial experiment involved injection of a fluorescently-labeled albumin into the vasculature of rats; by quantifying the degree of fluorescence in the plasma compared to Bowman's space, the authors were able to calculate a "sieving coefficient" for albumin. The sieving coefficient they arrived at was about .02--which is orders of magnitude higher than the previous value obtained via the micropuncture method, about .0006. This implies that nephrotic levels of proteinuria are being filtered from normal glomeruli, and the authors postulate a proximal tubular-based mechanism of rapid albumin reclamation. The nature of such a mechanism is unclear, but the authors suggest that vesicles of intact albumin are transcytosed through proximal tubular cells, providing evidence of this by showing an electron micrograph of endogenous albumin within proximal tubular cells. Finally, in a 2008 JASN article by Dr. Wayne Comper, the author sites various methodologic problems with some of the initial experiments used to demonstrate the "charge selectivity" model of the glomerulus. A recent follow-up paper in JASN by Russo et al furthermore suggests that it is an impaired tubular uptake of filtered albumin which accounts for the changes seen in early diabetic nephropathy. 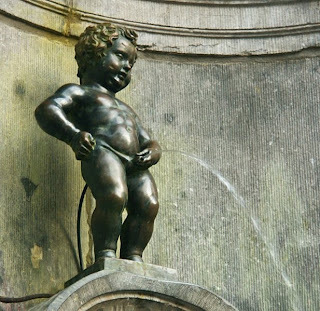 Con: The case against the "tubular proteinuria" model. Not surprisingly, this newer model has been met with much resistance. In an article by Christensen et al forcefully entitled, "Controversies in nephrology: renal albumin handling, facts, and artifacts! 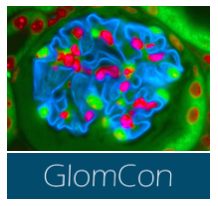 ", the authors describe their opposition to the idea that the glomerulus exhibits such large permeability to albumin. First, they point out several methodologic concerns with the technique of 2-photon microscopy, suggesting that the low fluorescent signal they observed is subject to misinterpretation; perhaps some of the "filtered albumin" seen in Bowman's space is fluorescent bleed-through from nearby blood vessels. The authors also point out a very logical question: if massive amounts of protein are retrieved by proximal tubular cells, why haven't we seen evidence of this throughout decades of research in this field? Many veterans of the field have simply not observed proximal tubular cells chock-full of vesicles containing endogenous albumin, and suggest that the published electron micrographs by Russo et al could be fixation artifact. Furthermore, the authors point out that mice lacking megalin function--thought to be a major player in protein uptake in proximal tubular cells--show only a mild degree of proteinuria, not nearly enough to be consistent with the massive amounts of albumin purported to be filtered by the glomerulus. Finally, virtually all of the mutations identified in patients with congenital nephrotic syndrome target genes known to be important in podocyte function: nephrin, podocin, alpha-actinin 4, etc, which would seemingly point to the podocyte, rather than the proximal tubular cell, as the primary player in regulating proteinuria. So: Who's right and who's wrong? I don't think we know yet, but for now my money is on the conventional explanation--in general, it seems that the "tubular etiology of nephrotic syndrome" is supported predominantly by a new technique, the limitations of which are not yet fully known, and in order to lend it further credence, alternative techniques which support this theory would be necessary. If it does turn out to be true, however, this would really represent a major paradigm shift in nephrology. The French, renowned for their culinary excellence, pride themselves on being able to include every part of the cow in a tasty dish. Regrettably, this includes finding uses for the many internal organs, one of the more challenging of which are the kidneys. 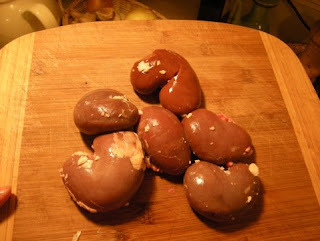 I have never eaten kidneys myself (nor do I plan to), but I imagine that they would not taste very good. They are, after all, the source of urine (not that I've drank that before, either, but it can't be tasty). The classic French dish for kidneys is "rognons de veau sauce moutarde" (veal kidneys in a mustard sauce). "Riñones al Jerez" attempts to mask the kidney taste with a sherry-based sauce. How Young is Too Young for Pediatric-to-Adult Kidney Transplants? We all know that there is a drastic shortage of donor kidneys available: in the state of Massachusetts, for instance, the average time on the kidney transplant waiting list we're quoting to patients is about 5 years...which for many elderly patients just starting dialysis exceeds their anticipated life expectancy! One potential strategy to increase the number of donor kidneys available is to accept kidneys from either the very old or the very young. With regards to the latter, pediatric kidneys--transplanted either into children, or into adults--have been used for many decades. However, the preferred method of transplantation has been to transplant BOTH kidneys from the pediatric donor en bloc to an adult recipient, in order to provide sufficient nephron mass to allow adequate renal function in an adult. A recent CJASN article by Zhang et al asks the question whether or not it is possible to divide up kidneys from a single pediatric donor into different recipients in order to effectively double the usefulness of available pediatric donor kidneys. The transplant program at Tulane University performed an analysis of two groups of adult patients: those who received pediatric kidneys from donors less than 5 years of age ("Group 1"), and those who received pediatric kidneys from donors between 5 and 10 years of age ("Group 2"). Interestingly, despite a higher rate of rejection in Group 1 compared to Group 2, the overall graft function outcomes were similar in both groups at 5 years. The authors conclude that single pediatric kidney transplants from donors younger than 5 years of age can be used with acceptable complications and long-term outcomes. The youngest donor in this study was a 9-month old girl weighing only 8 kg, with a kidney length of only 5cm, and strikingly both kidneys still functioning well 5 years out in different recipients! In the past I've struggled to get my head around the question of the role of statins in CKD. On the one hand they appear to slow progression, and people with lots of proteinuria often show some reduction in this measure over time. However, the effects on urinary protein excretion are at best variable, and there's no doubt that in some patients proteinuria actually increases. Despite this, the beneficial effects on preservation of renal function seem pretty consistent. This paper from Sydney, Australia clears up how, on the one hand, statins can increase proteinuria while still preserving renal function in the long run. It all has to do with mevalonate. In order prevent the 200 or so steps in cholesterol synthesis, statins nip the process in the bud by inhibiting HMGcoA at the beginning of the mevalonate synthetic pathway. Mevalonate is a precursor of isoprenoid pyrophosphates, which are necessary for G-protein prenylation of proteins involved in receptor-mediated endocytosis of albumin in the proximal tubule. Hence, the more potent the statin, the more it inhibits this reuptake pathway, causing albuminuria. This is why albuminuria is more frequently seen with newer, more potent statins such as rosuvastatin. As this is effectively an artefactual finding, patients with heavy proteinuria at baseline may show a reduction over time via improved endothelial function in their renal vascular bed. Admit it, that's pretty interesting. Shut up, it is. Changes are afoot at Renal Fellow Network! First off, we're going to feature a NEW CONTRIBUTOR to this blog! 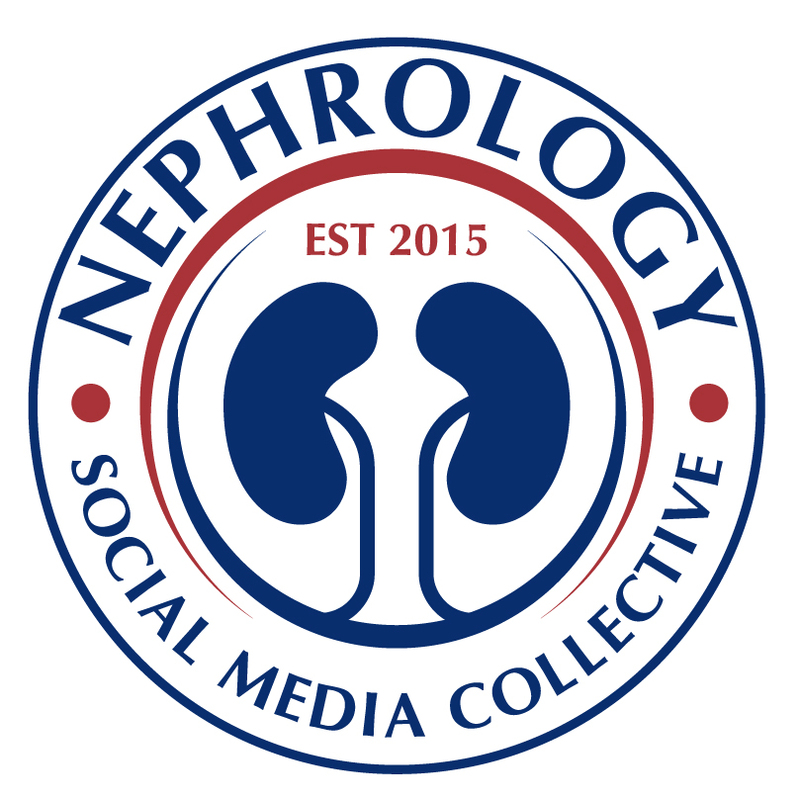 Despite the blog's moniker of "Renal Fellow Network", it has not been as much of a "network" as I'd like, as I (Nathan Hellman) have been writing 100% of the posts. As such, I'd like to welcome fellow Renal fellow Conall O'Seaghdha to the Renal Fellow Network! He will be contributing posts on a regular basis, and I think having multiple writers will enhance the variety of the site. We're also going to try a NEW FEATURE: The Renal Fellow Network POLL OF THE WEEK. I intend to post a different question every Thursday, and readers can vote over the course of the week. Finally, I'm going to be tinkering with a NEW FORMAT over the next few days. I've tried to select a background such that the text automatically adjusts to the size of your open window, which should ideally prevent wasted space. We'll see how that ends up; I'm still a relative neophyte in the HTML coding world. The goal of the site will still be to deliver a brief and easily-digestible nephrology teaching point on a near-daily basis--a process which becomes more and more relevant to those of us eagerly awaiting the Nov. 18th Nephrology Boards exam! 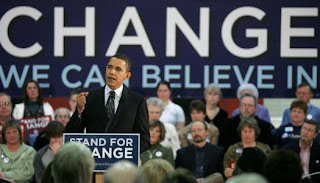 And that, my friends, is change we can believe in. Thanks for reading Renal Fellow Network and for those of you leaving comments, thanks. Too long have I seen the "Nail-Patella Syndrome" included in the differential diagnosis of renal disease without understanding anything about it...that ends today! The Nail Patella Syndrome (NPS), also referred to as Hereditary Onychoosteodysplasia, is an autosomal dominant inherited disorder which is caused by mutations in LMX1B, which encodes a transcription factor important in the development of the limb, eye, and kidneys. Although it most commonly results in nailbed deformities such as the one depicted and also dysplasia of the patellae or other bones, in about 1/3 of cases it can result in a nephropathy. The nephropathy of Nail-Patella Syndrome typically presents with either hematuria, proteinuria, or both. Both frank nephrotic syndrome and progression to ESRD are possibilities, though occur in a minority of patients. Biopsy shows fibrosis, and the presence of collagen fibrils which cause GBM thickening. It can probably be classified as a "podocytopathy" in the sense that knockout mice lacking the LMX1B gene show a deficit in podocyte development. The current thought is that patients with mutations which are more severe are the ones most likely to develop kidney disease. Bizarre case of hypernatremia: a suicide attempt by a 73 year-old Japanese man in which the individual drank massive amounts of soy sauce. According to this 2006 Neurology paper by Machino et al, the patient presented with vomiting, tremor, and altered mental status, along with a serum Na of 188 mEq/L, a serum chloride of 142 mEq/L, and a serum osmolarity of 314 mOsm/kg. MRI imaging demonstrated symmetric brain shrinkage consistent with severe, acute hyperosmolarity. Fortunately, rapid correction of the patient's sodium (the soy sauce ingestion had apparently been within 12 hours of his initial presentation) led to rapid clinical improvement. 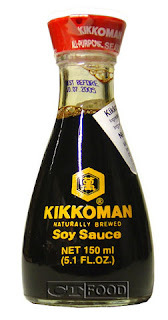 A similar 2004 case report by Sakai et al suggests that acute hemodialysis is another way to rapidly reverse hypernatremia as caused by acute soy sauce ingestion (over 1 Liter in this paper!). 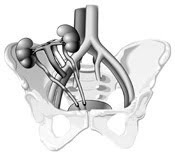 "When all access sites have been exhausted, exotic sites such as transhepatic or translumbar locations can be used for placement of a tunneled dialysis catheter." Besides transhepatic and translumbar locations, other "exotic sites" include the brachiocephalic vein (this case series by Falk describes 33 different patients who received a brachiocephalic catheter under ultrasound guidance with generally good results), the iliac vein (this report by Betz et al points out that while successful at providing dialysis, there exists the possibility of vascular damage which could make subsequent renal transplantation problematic), and even the great saphenous vein of the thigh (see article by Yates et al), which may be important in individuals who have stenosed or occluded central veins. Current KDOQI Guidelines recommend the use of some type of vascular mapping studies in order to prepare for the creation of an AV fistula or an AV graft. While physical exam is useful--typically, application of a tourniquet around the upper extremity and gross measurement of veins which could potentially be used as targets--it is often unable to identify suitable targets in many individuals who are obese or have deeper veins. Two other options are available for mapping: either duplex ultrasound or angiography, both of which have their benefits and drawbacks. Duplex ultrasound is attractive because it is non-invasive, and can be performed in both potential arterial and venous targets. There are also accepted ultrasound criteria which appear to predict, at least partially, the success of AVF maturation: in general, pre-op arterial diameter should be greater than 1.6mm and the venous diameter should be greater than 2.5mm at the site of anastamosis. Optimally, veins should be less than 0.5cm deep from the skin and should have an 8-10 cm straight segment for repeated cannulation. Duplex ultrasound is the preferred method of pre-op mapping according to KDOQI. Angiography appears to be comparable to ultrasound in terms of pre-op AVF/AVG planning, but has the advantage of being able to more directly identify central stenoses--an all-too-common finding in individuals with previous dialysis catheters or central lines that can easily prevent the successful development of an AVF/AVG if present. The main disadvantage of angiography, of course, is that it is invasive and involves the injection of contrast dye--which may not be wise for individuals with advanced CKD whose renal function is so tenuous that dialysis planning is underway. 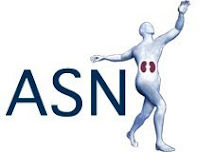 Cool new resource for all those iPod/iPhone (or whatever your MP3 player or PDA of choice happens to be): the ASN Kidney News podcast series. I have been listening to these during days in the lab where I happen to be carrying out some mind-numbingly repetitive task. 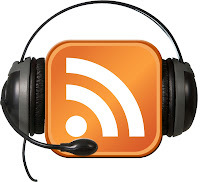 The most recent podcast is a conversation with Dr. Richard Glassock of UCLA in which he discusses how he approaches "the eGFR consult", a term which refers to the increasingly common situation in which a primary care physician refers an elderly patient to a nephrologist based solely on an estimated GFR that is determined to be abnormal. Presently, many hospitals will report every creatinine with a calculated GFR value based on the MDRD; often, values below 59 ml/min/1.73 m2 will be "red-flagged" as abnormal. Particularly in low body weight elderly patients, a stable creatinine of "only" 1.2 or 1.3 may come back with an eGFR indicative of CKD. Dr. Glassock makes the point that we may be putting too much faith in eGFR values. He states that there is poor correlation between eGFR and measured GFR in many instances, that the MDRD Equation by itself is presently unsuitable for approving decision about whether an individual may serve as a live kidney donor, and that we are still waiting for a more universal standardization of creatinine amongst labs. CKD Stage 3, for instance, makes up a large percentage of the population deemed "CKD" based on current KDOQI guidelines. Yet only a small fraction of these patients will go on to develop ESRD. One potentially useful approach is suggested in Great Britains "NICE Criteria for CKD"--they subdivide CKD Stage 3 in to "A" (eGFR = 45-59 ml/min) and "B" (eGFR = 30-40 ml/min) groups, and furthermore give patients a label of "P-positive" or "P-negative" based on whether or not proteinuria is present. Not surprisingly, individuals who are Stage 3B-P+ have a very high risk of progression of their kidney diseases, whereas individuals who are Stage 3A without proteinuria apparently have no increased risk of reaching ESRD. I think most nephrologists realize this fact (that proteinuria is a useful way of risk-stratifying patients falling into the CKD 3 category), but perhaps modifying the criteria used by PCPs and other physicians might lead to more optimal nephrology referral patterns in the future. The discovery of aquaporins--the protein family of water channels which regulate water transport in the kidney and many other tissues--was considered significant enough to win the Nobel Prize in Chemistry for Peter Agre in 2003. The aquaporins are a large family--there are at least 12 aquaporin genes in humans and possibly more--but which ones are important in the kidney? 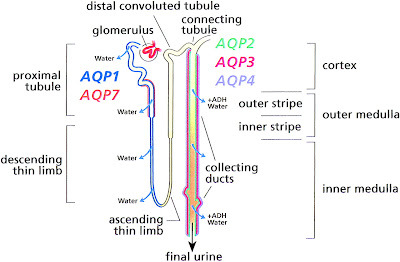 It turns out that different aquaporins are expressed in discrete segments along the nephron. The one which gets the most attention is likely aquaporin-2 (AQP2), which is expressed in the apical membrane and intracellular vesicles of principal cells of the collecting duct. AQP2 is the predominant vasopressin-responsive aquaporin, and is therefore responsible for the majority of regulation of water reabsorption in the collecting duct. According to the current model, vasopressin binds to its receptor on the basolateral surface of collecting duct cells, resulting in an increase in cyclic AMP, protein kinase A activity, and the increased trafficking of intracellular AQP2-containing vesicles to the apical membrane, where they fuse with the plasma membrane and allow water reabsorption to take place. Mutations in the AQP2 gene account for some cases of nephrogenic diabetes insipidus. The other aquaporins also play specific roles in water transport. For instance, aquaporins-3 and -4 are expressed at the basolateral surface of cortical collecting duct cells and are responsible for movement of water taken in by AQP2. Aquaporin-1 is extremely abundant in the proximal convoluted tubule and descending thin limb, but is notably absent in highly water-impermeable segments such as the ascending thin limb, thick ascending limb, and distal tubule. 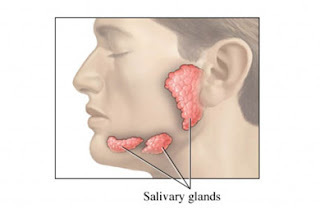 Sjogren's syndrome is an autoimmune disorder in which there is immune-mediated damage to the exocrine glands which produce tears and saliva. Many patients (up to 25%) will have extraglandular manifestations of the disease, one of the possibilities of which is renal disease. A recent article in CJASN by Maripuri et al describes a large case series of patients with primary Sjogren's Syndrome and simultaneous renal disease. In this series, 24 out of 7276 patients seen within the Mayo Clinic system over the past 4+ decades had undergone renal biopsy. What were the most common lesions seen on biopsy? By far the most consistent result was the presence of interstitial nephritis, which accounted for a full 71% of patients who underwent biopsy. TIN is often association with a distal RTA (and less commonly a proximal RTA) with accompanying hypokalemia and nephrolithiasis. 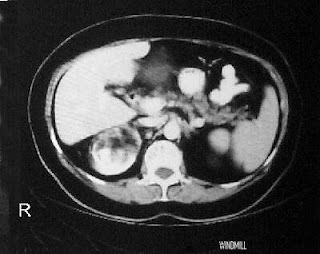 Other lesions included cryoglobulinemia (often with an MPGN pattern on biopsy), FSGS, and other GN's. Nearly all the patients in this series were treated with corticosteroids; based on the observation that most patients showed a general lack of rapid progression of their kidney disease, the authors justify the use of immunosuppressive therapy in patients with Sjogren's Syndrome. Okay, you're probably not going to see this in your lifetime, but imagine how cool you'll seem when you whip out "matchstick ingestion" as part of the differential diagnosis for hyperkalemia and AKI. 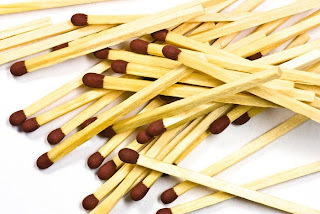 Matchstick heads are comprised of over 50% potassium chlorate (KClO3); it is an oxidizing agent which makes matches flammable and can also be found in many explosives and fireworks. Unfortunately, it also happens to be nephrotoxic. In this interesting case report by Mutlu et al, the authors describe a 21-year-old man who attempted to commit suicide by ingesting 120 matchsticks. When he first presented to the ED, he had a serum potassium of 7.4 with peaked T-waves. The potassium chlorate results in a rapid oxidative destruction of RBCs while also causing methemoglobinemia, and acute renal failure is common. A toxic dose is listed as being 5 grams; the patient in this case report only ingested 2 grams was fortunately treated successfully using acute potassium-lowering therapy and hyperbaric oxygen therapy (for the methemoglobinemia). Heard an excellent presentation at our Renal Grand Rounds today by Dr. Charles O'Neill of Emory University, regarding the process of pathologic calcification in CKD/ESRD patients. One of the points I took away from this talk is that we need to re-evaluate the role of the "calcium-phosphate product" in clinical medicine. Presently, the KDOQI guidelines state that nephrologists should attempt to maintain the Ca x P product below 55 in order to minimize pathologic calcification. I had always been taught that if the Ca x P product exceeds 55, there is a tendency for calcium phosphate to precipitate and deposit within the walls of blood vessels. Is this true? This 20007 KI review ("The Fallacy of the calcium-phosphorus product") makes the case that this view is erroneous. The majority of medial calcification seen in CKD/ESRD patients is in the form of hydroxyapatite, which is much more complex than calcium phosphate; the chemical structure is Ca10(PO4)6(OH)2. As the formation of hydroxyapatite involves multiple separate steps, it is very unlikely to occur spontaneously. A more likely scenario is that a local balance between specific calcification inhibitors (e.g., pyrophosphate) and activators (e.g., alkaline phosphatase) maintained at a local level determines whether or not pathologic calcification occurs. Furthermore, experiments in which exogenous calcium and phosphate were added to samples of human plasma demonstrated that calcium-phosphate precipitation did not occur until the Ca x P product exceeded over 200--a number which is never achieved in human patients. Nonetheless, despite these potential flaws in the physiologic rationale for the Ca x P product, there is abundant epidemiologic evidence showing an association between the Ca x P product and cardiovascular mortality. Perhaps this simply reflects the observation that serum calcium and serum phosphate levels each independently potentially contribute to pathologic calcification. In any case, the prevailing current approach is to control serum phosphate levels with binders to within the normal range as much as possible while tolerating some degree of mild hypocalcemia. Since I'm presently trying to make it through the most recent ish of NephSAP--their first-ever issue of "Interventional Nephrology"--I'll do another access-related post. A "secondary AV fistula" refers to a fistula created after a pre-existing graft or fistula has either outright failed or been determined to be suboptimal for continued dialysis. The creation of secondary fistulas represents an important way in which nephrologists might increase their overall percentage of patients dialyzing via AV fistula (see "Fistula First Campaign") rather than simply targeting incident CKD patients initiating dialysis. 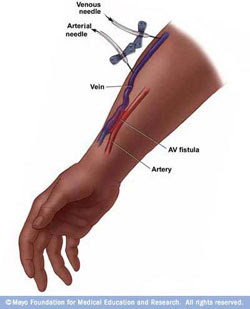 From a terminology perspective, a "Type I secondary AV fistula" refers to when the outflow vein of a pre-existing AVF or AVG is able to be used as a target for a new "converted" AVF; the advantage of Type I AVFs are that they can often be used shortly after placement, not requiring lengthy maturation times and potentially avoiding the use of a transient dialysis catheter altogether. In contrast, a "Type II secondary AV fistula" refers to an entirely new AVF, which can occur either on the ipsilateral or contralateral side with reference to the failed fistula. How well do secondary AVF perform? In one 2002 report by Ascher et al, 71 secondary fistulas demonstrated a 1-year and 2-year primary patency rate of 58% and 22%, respectively. These results are not suprisingly worse than the primary patency rates for primary AVFs (75% and 61%, respectively), but nonetheless demonstrate that in a few dialysis patients, the creation of a secondary AVF can give successful, long-term dialysis access. Hopefully, a better understanding of the process by which AV fistula fail could eventually lead to medications or surgical breakthroughs which might prolong the longevity of secondary access attempts. The "Fistula First" initiative, which has as its goal the increase in % of dialysis patients who dialyze via an AV fistula rather than an AV graft or catheter, has been a controversial initiative. Although few would debate that a working AV fistula is superior in terms of a decreased infection rate and improved graft longevity, there are many patients in whom attempted AV fistulas fail to mature, and delays in waiting for a functional AV fistula to develop have been suggested as a cause of patients who must start dialysis via catheter. Due to this potential for delay in AV fistula maturation, it makes sense that we should perhaps err on the side of having the AV fistula placed earlier rather than later. Which brings us to the question: When should we refer CKD patients for AV fistula placement? I don't think the answer is clear, but the present KDOQI recommendations are that access placement should occur once the GFR drops to less than 25 mL/min, if the serum creatinine goes greater than 4 mg/dL, or within 1 year of an anticipated need for dialysis. It also states that a new primary fistula should be allowed to mature for a minimum of 1 month, and ideally for 3-4 months prior to cannulation (AV grafts, by comparison, require a maturation time of only between 3-6 weeks according to these guidelines). In this 2004 JASN article entitled, "Late creation of dialysis access for hemodialysis and increased risk of sepis" by Oliver et al, investigators from Canada performed a retrospective analysis of patients starting dialysis who had their access placed either "early" (defined as being placed greater than 4 months before initiating HD), "just prior" (defined as being placed between 1-4 months before initiating HD), and "late" (defined as being placed 1 month before initiating HD). Of note, the majority (3687 of 5924) were "late" access placements. Early access creation was associated with a relative risk of sepsis of 0.57 and a relative risk of mortality of 0.76, both of which were predominantly explained by an increase in catheter use observed in the "late" group. Granted, this is not a prospective trial, but it does seem to provide some rational evidence in support of early AV fistula placement. My personal (and still limited) experience in this area: I think that many nephrologists know that early AV fistula placement is important, and this is discussed with patients at routine CKD office visits. The challenges come from two main areas: (1) actually convincing the patient to go ahead with it (there are often very powerful mechanisms of denial involved in a patient actually accepting the fact that they are eventually headed for dialysis), and (2) administrative delays in setting up a patient to be seen by a vascular surgeon. If anybody has any tips on ways to increase early AV fistula placement, please share them! Mutations in the CFTR gene are responsible for cystic fibrosis. CFTR encodes a chloride transporter which in addition to its being expressed in the lungs and pancreas, is also found in the kidney. As I have blogged about previously, the CFTR chloride channel is responsible for chloride secretion in the human kidney, and may play a role in cyst expansion in individuals with polycystic kidney disease. It turns out the CFTR chloride channel also has some interesting interactions with ENaC: the epithelial sodium transporter expressed in the collecting ducts of the kidney we all know and love. Like CFTR, ENaC is expressed in a variety of tissues other than just the kidney. It is also expressed in the skin and lungs, for example. In the skin, coupled ionic transport via CFTR and ENaC are responsible for normal sweat gland function; CFTR secretes chloride and the ENaC reabsorbs sodium from the skin. In the sweat gland, CFTR has a stimulatory effect on ENaC. Thus, in cystic fibrosis, when CFTR isn't working, ENaC activity is also depressed, and sodium reabsorption from the skin is suboptimal. This explains why patients with cystic fibrosis have sweat which tastes extremely salty, and provides the rationale for the chloride sweat test used in the diagnosis of cystic fibrosis. The CFTR/ENaC relationship is just the opposite in tissues such as the lung: CFTR exerts an inhibitory effect on ENaC, and therefore in patients with cystic fibrosis, ENaC activity is significantly upregulated. 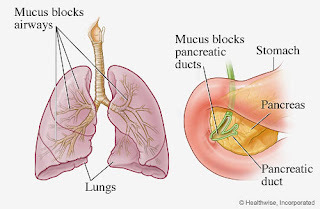 The abnormally high sodium uptake from airway mucus results in a thick, viscous, dehydrated substance which is retained in the airways and predisposes to pulmonary infections, the hallmark of cystic fibrosis. "Osmotic nephrosis" is a term which describes a common form of renal tubular injury in response to hyperosmolar substances. It is especially relevant to iv contrast nephropathy, and was first observed in animals and human patients infused with hypertonic sucrose. The pattern of injury is shown below (images from a 2008 AJKD review by Dickenmann et al): by both light microscopy and electron microscopy, there is vacuolization and swelling, predominantly along the apical membrane of proximal tubular cells. In addition to iv contrast nephropathy, the osmotic nephrosis pattern of injury can also occur in response to IVIG, mannitol, and hydroxyethyl-starch ("hetastarch"). It is useful a reversible injury, but not always. Vacuolated cells can be seen in other forms of renal injury (e.g., calcineurin inhibitor toxicity, renal clear cell carcinoma, foam cells) which must be differentiated from osmotic nephrosis. One of the major medical advances over the past few decades has been the success of stem cell transplants, which serves as a potential cure for many patients with previously untreatable leukemias and lymphomas. With the expanded use of stem cell transplant, however, has come an increasing recognition that acute kidney injury can be a major complication of this treatment. An excellent 2005 review by Humphreys et al in JASN describes some of the most common causes of AKI in stem cell transplant patients. The differential diagnosis of AKI in stem cell transplant recipients can be initially categorized by time period following transplant: that is, AKI developing in the immediate peri-transplant period, the "early period" (e.g., between 10-20 days post-transplant), and the "late period" (after a few months post-transplant). The most common causes of immediate AKI are relatively rare, but include tumor lysis syndrome (which is fortunately becoming less common based on improved monitoring and newer drugs, such as Rasburicase) and toxic effects deriving from the marrow infusion itself--there is evidence that DMSO (an agent used to prolong cell life) can cause hemolysis and resultant AKI, for instance. The most common causes of early AKI include standard causes (e.g., pre-renal failure from prolonged vomiting or diarrhea, obstruction, ATN from hypotension, etc) but also includes oncology-specific diagnoses such as vaso-occlusive disease (a subset of hepatorenal syndrome felt to be due to endothelial damage). These patients are often exposed to known nephrotoxins (e.g., amphotericin B, calcineurin inhibitors, iv contrast) which may also be playing a role. Hemorrhagic cystitis (a complication of high-dose Cytoxan often used as a conditioning regimen) can result in obstructive renal failure. Methotrexate, often used as an agent to prevent graft-versus host disease (GVHD), can cause a crystal-induced AKI. Patients with profound neutropenia are also at risk for infections (e.g., fungemia, bacterial sepsis) which frequently cause kidney injury. In terms of late post-stem cell transplant causes of kidney failure, the main offender here is calcineurin inhibitor toxicity. In general, this affects individuals who get allogeneic stem cell transplants much more so than autologous transplants, as only the former generally require immunosuppressive agents such as CNIs in order to prevent GVHD, and helps explain why the rate of kidney injury is greater in allogeneic recipients compared with autologous ones. Many patients develop a low-grade thrombotic microangiopathy felt to be multifactorial in etiology which includes prior irradiation exposure causing endothelial damage, CNIs, and GVHD. Scary article--from both a patient care perspective as well as from a medicolegal perspective--which will make you think about always checking that potassium level before making a decision about skipping dialysis..."Young Mother Dies After Missing Dialysis Treatment". 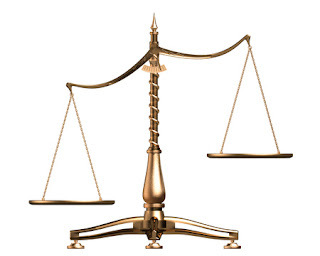 In order to be found guilty of medical malpractice, a physician must demonstrate "The Four D's": a "dereliction of a duty directly causing damages." According to this site maintained by the Kaiser Family Foundation detailing malpractice rates by state, there were approximately 17.1 malpractice claims paid for every 1,000 active non-federally employed physicians in the U.S. in 2005. Taking all comers, that means there was a 1.7% chance of any given physician having to pay out as a result of a lawsuit during that one year. 1.7% may not seem like a big number, but considering that (a) a 1.7% annual chance multiplied over the course of a 35-year career starts to get pretty high, and (b) this does not factor in all the unsuccessful lawsuits, which can result in substantial legal fees and time investment, it's high enough. President Obama will be discussing the possibility of including major medical malpractice reform as part of the overall health care reform package being developed. 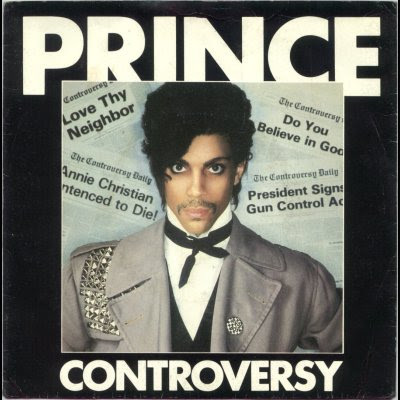 It will be interesting to see what he has to say about this, and the reaction from both parties. Recent NY Times article in which the notion that tort reform would lower health care costs is disputed can be found here. I included two question marks in the title, since the existence of Lyme Nephritis remains controversial. However, somebody presented a case of alleged Lyme Nephritis in a recent Renal Grand Rounds which was interesting. In brief, the case revolved around a resident of the Cape Cod area who presented with evidence of acute Lyme disease including several weeks malaise, nausea/vomiting and myalgias. The patient was given a diagnosis of Lyme disease based on a positive IgM Lyme titer, and was treated with doxycycline. At a return visit, it was noted that the individual had developed an acutely elevated creatinine (went from a baseline of 1.1 mg/dL to 1.8 mg/dL) and had a urinalysis showing hematuria, about 1 gram of proteinuria, and dysmorphic RBCs. 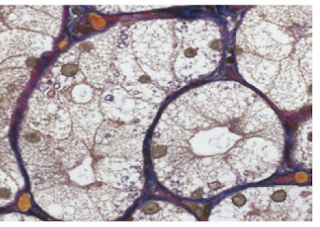 A renal biopsy was performed, demonstrating an immune-complex-mediated MPGN histologic pattern. Despite a thorough workup to exclude other causes of this type of injury (e.g., SLE, hepatitis, endocarditis, etc), nothing could be pinpointed, and based on the temporal association between the onset of Lyme infection and renal disease, a tentative diagnosis of "Lyme Nephritis" was considered the most likely. There are other case reports in the literature of Lyme Nephritis (see 2004 AJKD article by Kirmizis et al), and furthermore it has been noted that dogs infected with Lyme disease frequently experience an often lethal glomerulonephritis. However, Lyme Disease is common around these parts (somebody quoted a 1 in 5 Lyme infection rate amongst residents of nearby Martha's Vineyard, with rates of about 1 in 20 around the Cape Cod area), and it is possible that in this instance the Lyme Disease and GN are separate processes which just happened to occur at the same time. Calcium phosphate stones are actually pretty rare. While calcium oxalate stones comprise about 80% of all instances of nephrolithiasis, calcium phosphate stones typically occur only in a small subset of patients--about 5 to 10% of patients according to this source. 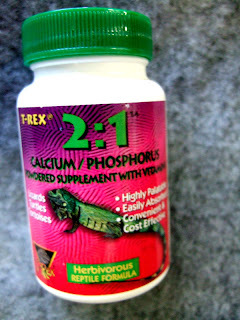 In particular, calcium phosphate nephrolithiasis is encouraged by an alkaline urine. Thus, three conditions in which calcium phosphate nephrolithiasis may commonly occur are distal renal tubular acidosis, primary hyperparathyroidism, and milk-alkali syndrome. 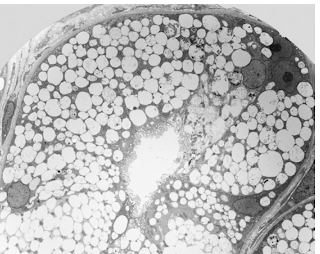 In patients with distal (type I) RTA, there is a direct effect of acidosis which decreases renal calcium reabsorption; in addition, acidosis stimulates bone resorption (which increases serum calcium and phosphate levels) which can contribute to supersaturation of calcium and phosphate in the tubular lumen. Tuberous sclerosis complex (TSC) is a rare genetic disease, caused by mutations within one of two genes (TSC1 or TSC2) which is named for the formation of hard tumors ("tubers") within a variety of tissues, including the CNS, kidneys, eyes, heart, lungs and skin. Often, dermatologic clues can be essential to making a diagnosis; common examples include facial angiofibromas (a rash of reddish spots appearing on the nose and cheeks in a butterfly distribution), "ash leaf spots" (hypopigmented macules), ungual or subungual fibromas, Shagreen patches (areas of thick, leathery skin, often found at the nape of the neck), and cafe au lait spots. Most patients with tuberous sclerosis have some renal lesion, though fortunately it is usually not severe. There are a wide range of renal manifestation of TSC, many of which are detailed in this 2006 Kidney International review by Rakowski et al. About 80% of patients have renal angiomyolipomas, an abnormal collection of blood vessels, smooth muscle, and fat cells; these are best identified on CT as fat-containing lesions. They are felt to pose little to no risk of evolving into anything malignant, though they are at risk for bleeding (and sometimes even catastrophic bleeding). In addition to angiomyolipomas, up to 45% of TSC patients get cysts. Rarely, TSC and ADPKD can occurs simultaneously, as the TSC1 gene and PKD1 gene are located near one another and may be deleted in some instances. Finally, about 1-2% of TSC patients will develop renal cell carcinoma. This can be tricky to diagnose (especially given the high likelihood of angiomyolipomas or simple cysts). Individuals with TSC who get kidney failure and enjoy a transplant generally do well, though the current recommendation here is to perform a bilateral native nephrectomy at the time of transplant in the hopes of minimizing the cancer risk in the setting of immunosuppression. There are numerous formulations of recombinant human erythropoietin, but only a few of which are used in the U.S. Generally speaking, all of the formulations have the exact same 165 amino acid core sequence which encodes the human erythropoietin protein; the main aspect in which they differ is in their degree of glycosylation. 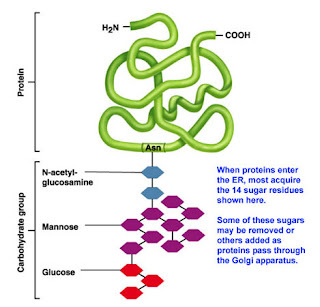 Glycosylation refers to the enzymatic attachment of sugar molecules onto a protein via Asparigine residues (N-linked glycosylation) or via Threonine or Serine residues (O-linked glycosylation). It turns out to be extremely important for stability of EPO, as non-glycosylated recombinant erythropoietin has an extremely short (and therefore not clinically useful) half-life. A breakthrough in the manufacture of recombinant human erythropoietin came with the manufacture of transfected EPO within Chinese hamster ovary (CHO) cells, a cell line which is avidly glycosylates proteins. Epoetin-alpha (either Procrit or Epogen in the U.S., and Eprex in Europe) is grown in CHO cells and consists of about 40% carbohydrate. These medications are all about 30kD and have a half-life of about 7-8 hours. Darbepoeitin-alpha (Aranesp) has a slightly modified amino acid sequence which adds an additional 2 N-linked glycosylation sites, which increases the drug to 51% carbohyrate content, 37.1 kD in size, and a half-life of between 21-24 hours. There are other recombinant human erythropoietins (e.g., epoetin-beta, epoetin-delta, epoetin-omega) but these are not commonly used in the U.S. While the ACGME regulates the vast majority of post-graduate residencies/fellowships, there are a few exceptions. One of the notable ones is the rapidly evolving Kidney Transplant fellowship. Previously, nephrologists were certified as members of the kidney transplant community based on their experience, having met various criteria that were based primarily on past experience with kidney transplant patients; there were not official training programs in existence. 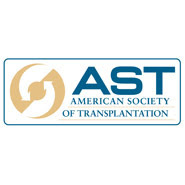 Since 1998, however, the ASN and the American Society of Transplantation (AST) began a joint effort to standardize the training of transplant nephrologists. Because the number of graduates of such programs is relatively small (only 29 in all of 2008, according to the most recent issue of Kidney News), they are not regulated by ACGME. However, there is presently an AST Accreditation Committee which has been charged with approving transplant fellowship programs as sanctioned training programs. I am not sure if it is currently absolutely essential to be trained under an officially licensed program in order to practice as a transplant nephrologist, but my guess is that eventually it will become the law of the land. For a list of all the 49 AST-accredited transplant nephrology fellowships, click here. In 1999, the Accreditation Council for Graduate Medical Education (ACGME)--the organization which oversees all residency and fellowship programs in the U.S. and is responsible for their official status as a licensed training program--issued a list of 6 Core Competencies which need to be addressed in all training programs. This blog would probably fit best under the category of "practice-based learning and improvement." Dialyzer reactions can be classified into two types: "Type A" and "Type B".Simplistically stated, one is serious and the other one isn't. A good pneumonic I recently learned from Dr. Daniel Coyne of Washington University-St. Louis at a Boards Review course is that "Type A" (the serious one) can be remembered as "anaphylactic", while "Type B" (the less serious one) can be remembered as "boring". Type A reactions occur very shortly after dialysis is initiated--typically within the first few minutes or so--and are thought to be due to pre-formed IgE antibodies causing mast cell degranulation and an aphylactic-type reaction. Symptoms include hypotension, chest pain, dyspnea, and (my favorite) a "sense of impending doom." An outbreak of Type A reactions was previously associated with ethlyene oxide, once used in the dialyzer sterilization procedure, but can presumably be due to other leachable compounds within dialysis cartridges. Treatment of the Type A reaction involves immediately stopping the dialysis procedure (which ideally involves clamping off the dialysis tubing to prevent any more of the patient's blood trapped in the extracorporeal circuit from re-entering the body), administering medications such as epinephrine, steroids, and antihistamines, and standard supportive care which may require pressors or bronchodilators. Type B reactions in contrast tend to occur in a more delayed fashion--say, after 15-30 minutes into dialysis--and symptoms include chest/back pain, nausea/vomiting, and more mild hypotension. The mechanism here is thought to be complement-mediated. It was apparently more common with cellulose-based membranes and is less commonly a problem with the more modern synthetic membranes. Since symptoms are generally mild and can improve with time, the dialysis treatment can usually continue.